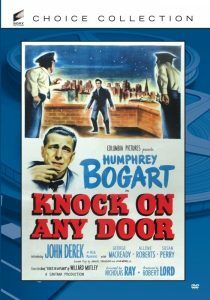 Knock on Any Door (1949), starring Humphrey Bogart and John Derek — I’m a large fan of Humphrey Bogart, and I fully expected to enjoy watching Knock on Any Door —  but, unfortunately, I didn’t. It’s the story of an underprivileged young man, a product of the slums, who becomes bitter after his father’s death. That bitterness leads him to a series of bad decisions, where time and again he has an opportunity to turn his life around —  and doesn’t. Humphrey Bogart’s character is there at several of these crucial junctions. This includes the major drama of the movie —  when the young man is on trial for murder. The young man is guilty, convicted, and sentenced to death. Humphrey Bogart walks with him to the execution. The message is heavy-handed. During the trial, Bogart literally states that this young man’s repeated choices are society’s faults. He chose to commit selfish, evil, easy choices – repeatedly. There is no personal responsibility, and no accountability —  because it’s not his fault, it’s ours —  somehow. Though Humphrey Bogart is the official star KNOCK ON ANY DOOR, the film is essentially a showcase for Columbia’s newest young male discovery John Derek. The first production of Bogart’s Santana company, the film casts Bogart as attorney Andrew Morton. A product of the slums, Morton is persuaded to take the case of underprivileged teenager Nick Romano (Derek), who has been arrested on a murder charge. Through flashbacks, Morton demonstrates that Romano is more a victim of society than a natural-born killer. Though this defense strategy does not have the desired result on the jury thanks to the badgering of DA Kernan (George Macready), Morton does manage to arouse sympathy for the plight of those trapped by birth and circumstance in a dead-end existence. As Nick Romano, John Derek would never be better, nor would ever again play a character who struck so responsive a chord with the audience. Nick’s oft-repeated credo — ’Live fast, die young, and leave a good-looking corpse —  — became the clarion call for a generation of disenfranchised youth. Director Nicholas Ray would later expand on themes touched upon in KNOCK ON ANY DOOR in his juvenile delinquent — chef d’oeuvre’ REBEL WITHOUT A CAUSE. Viewers are advised to watch for future TV personalities Cara Williams and Si Melton in uncredited minor roles. KNOCK ON ANY DOOR spawned a belated sequel in 1960, LET NO MAN WRITE MY EPITAPH.